Primavera is the Italian and Spanish word for Spring. When I think of Spring I think of all things fresh and green. Here in the Midwest, Spring means we can pack up the hats, gloves, and scarves and pull out the flip-flops (then the next week pull out the hats, gloves, and scarves again). In a couple weeks the farmer’s markets will be in full force and full of delicious fruits and veggies –I can’t wait! I found this recipe in my Parents magazine and knew I had to try it. The article was Dinner Detox, how to healthify your dinners in stages. This dish is considered (by them) to be a really healthy alternative to Mac ‘n’ Cheese. I skipped the “little better” recipe and went straight for the really healthy. 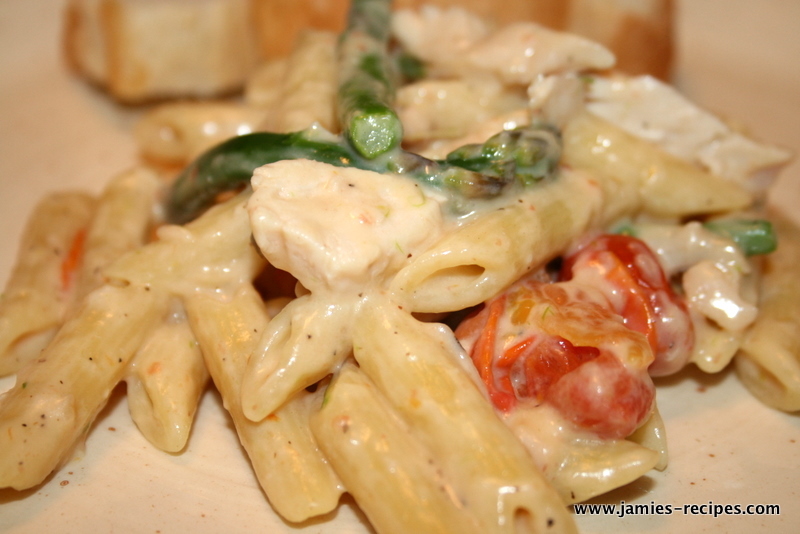 My kids like veggies, and they love pasta, so I wasn’t worried that they wouldn’t like it. This is a fun recipe to personalize with your family’s favorite vegetables. I added roasted chicken to our dish to give it a little extra protein, but I think shrimp would be fabulous too. This is a great way to use up veggies in your crisper drawer. Some yummy selections might include broccoli, zucchini slices, fresh blanched green beans, sliced yellow squash, fresh basil, roasted cauliflower or Brussels sprouts. Be creative! 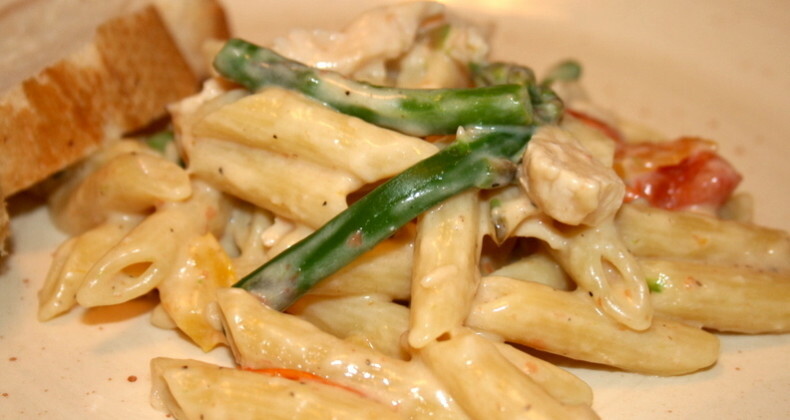 Two minutes before your pasta is done, toss in asparagus. Drain pasta and return to pot. While pasta is cooking, sautee yellow pepper, garlic and tomatoes in the olive oil. Toss in chicken (if using) and heat through. Add veggie mix to pasta. Whisk milk, broth, and flour. Add to pasta, stirring until thick. Mix in cheese, add salt & pepper to taste. ENJOY! !